Does anyone besides me have a huge stash of items you plan to turn into something else? I have a whole shelf full of batting and seasonal placemats–just waiting to become pillows! When I pulled out my Easter stuff (just last week–yikes, am I ever behind), I found these egg-shaped placemats that I bought for $.50 each after Easter a couple of years ago. Every time I get them out, my kids ask when I am going to turn them into pillows. Well, this time, I said, “Right now!” Each pillow took about 1/2 hour and only three steps. It doesn’t get much easier, and you can do it, too! To get started, you’ll need to stalk the clearance aisles after major holidays. (Valentine’s Day and Easter for Spring decor; 4th of July for Summer decor; and Thanksgiving and Christmas for Fall/Winter decor.) Look for double-sided placemats. They must be made with two layers sewn back to back. Step 1: Using a seam ripper, open the seam wide enough for you to fit your arm in and reach all the way to the other side of the mat. Step 2: Stuff it with batting, fiber fill, or even fabric scraps. I seriously considered snipping all of the kids’ old socks into tiny pieces. Step 3: Stitch the seam back together, and enjoy your new pillow! Have fun, and thanks for stopping by! 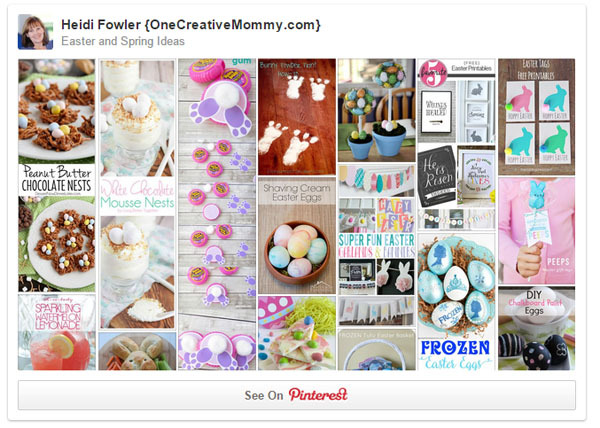 Be sure to follow my Easter and Spring Ideas Pinterest Board for more great ideas! I am pinning this. 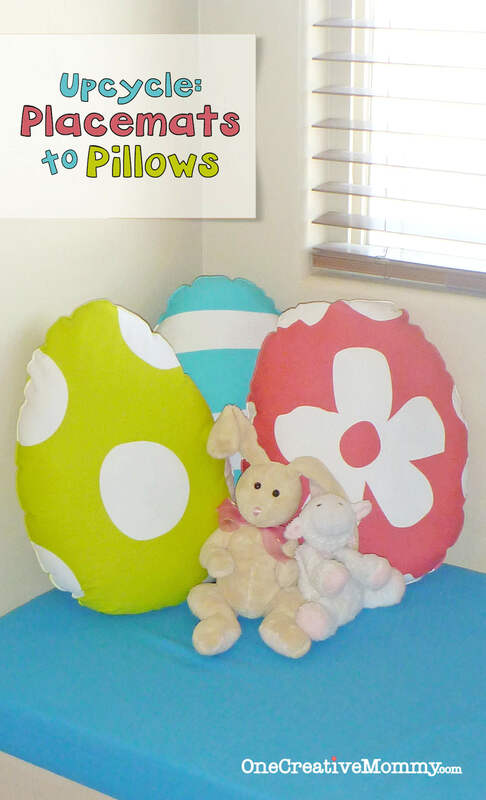 Very cute pillows and the best part is it is up recycled. Awesome. I would like to invite you to join Pin It Monday Hop Where you pin and get pinned(link). Followed you via G+, Pinterest, and added you to my Feedly. If you get the chance, I’d love for you to stop by and join us. I hope to see you there. Too cute. Perfect for a child’s room, bright and cheery. I’m visiting from PJH Designs Transformed Tuesdays. These are so cute! What a great idea; placemats are so cute I love this idea for them! You are a Featured Favorite on Saturday Show & Tell at Cheerios and Lattes this week, thanks for joining us last week, we love having you! Can’t wait to see what you’ve been up to this week! I love it, Absolutely Cute :D A perfect idea for my daughter’s bedroom! Heidi, these are super cute! Happy Easter and thanks so much for sharing this on WNWNW, I’ve pinned it. You are just so creative. I love these egg pillows. I’m the pillo w ‘addict’ I’d say (wink). Thank you for sharing them with us. Can’t wait to see what you’ll be sharing with us this week! Aww these are too cute! Thanks for sharing with Hump Day Happenings.